If you are in the market for a new car, this is the one time of year where a consumer has the advantage over a car dealer. End-of-year sales and savings on new cars are real, and there is even a best day to buy before the calendar changes to 2015: New Year's Eve. Some car analysts say you may be able to save as much as 10 percent in incentives, before you negotiate a single number on price. For five days, between Dec. 26 and New Year's Eve, consumers can walk into any new car dealership already in a negotiating position of power. "We call this new car new year because it's really the single biggest car shopping week of the year," says Philip Reed, the senior consumer advice editor for edmunds.com, a website that tracks sales of new and used cars. "There are bargains, discounts and also incentives and these will increase as you get closer to the new year." End of the year is totally different from end of month, says Matt Unger, the general manager of Lexus, Santa Monica. He says the last week of December and the last day of the month are more about moving product than earning profit for dealerships. "We have cars at the Port that are overflowing here," he says. "So I have six different lots with cars in them. I have over 700 cars in inventory." By inventory, Unger means 2014 models, every dealership is looking to sell them to make room for newer 2015s, a major advantage for consumers. "You're going to get a little bit deeper discounts on the 14s, maybe $4,000 to $5,000 to $6,000, depending on how much the car is," Unger says. 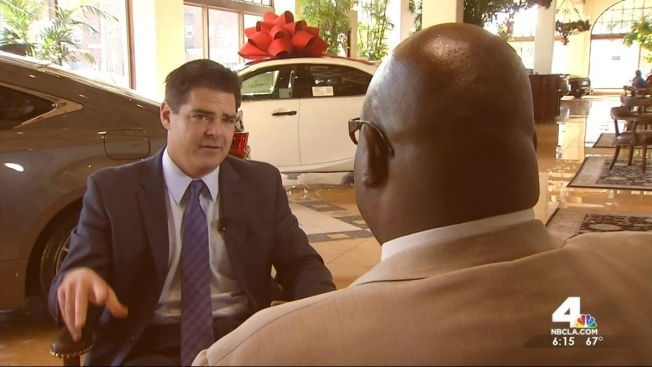 Reed says end-of-year dealership incentives favor consumers. There are manufacturer rebates, loyalty cash for repeat customers, conquest cash for switching car companies, and dealer cash just to help push a deal through. The dealerships are under a lot of pressure to make sure they sell their cars so they can meet their quotas and get a good inventory next year, Reed says. At Lexus Santa Monica the goal is to sell 200 cars between Dec. 26 and 31. "There isn't a deal that we would let walk out the door right now," Unger says. Even gift wrapped, a new car may not fit beneath your tree, but it could be within your budget. Get to the dealership early. It will be packed.